Heading in the direction of handmade gifts this year, off to the kitchen I went to make my holiday goodies. 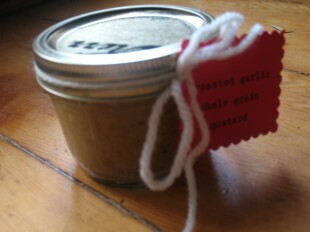 I decided to make an artisan mustard as one of my gifts to give away. This mustard recipe is delightfully spicy, tangy and a little sweet, with a texture that compliments crusty bread or grilled sausages and onions. Package it as a gift in a glass jar with a handmade tag and ribbon or just keep it all for yourself! Combine mustard seeds, vinegar and water in bowl. Cover and let stand until seeds have absorbed the water (4-8 hours). Preheat oven to 400 degrees. Peel garlic cloves and place in a small baking dish. Drizzle olive oil over garlic cloves. Cover with foil and roast until cloves are very soft, about 30 minutes to an hour. Combine roasted garlic cloves and half of the soaked mustard seeds in blender. Pulse until blended, adding small amounts of water if needed to blend, until mixture is grainy. Pour this mixture into a large bowl. Repeat this step with the remaining garlic and mustard seeds. Add this to bowl and stir in salt and maple syrup. Now package in jars and your finished!